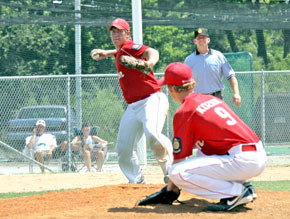 Cornerstone Legion Baseball lost two games by lopsided scores, but also posted one victory in the 2011 American Legion Juniors State Tournament at Beatrice. 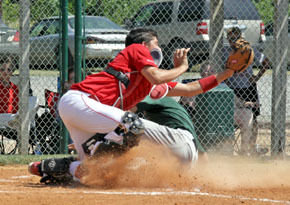 Cornerstone received several tough assignments in the tourney. In a blind draw setting the first round bracket, the Albion Juniors were matched against Area 2 champion Gretna, home of one of Class B’s top high school baseball programs. After defeating York Cornerstone Blues in the playback bracket, Albion Cornerstone then faced the host team – the Beatrice Eagles – in another elimination game. With its 1-2 mark at state, Cornerstone concluded an exciting season with an overall 21-12 record. Cornerstone simply could not match the booming bats of Gretna Post 216 in the state opener, dropping a 13-5 decision Saturday. Albion scratched out runs by Calvin Koziol and Cole Luettel in the top of the first on two infield singles, a Gretna error, a walk and Chris Bode’s RBI base hit. Gretna came right back with four of its own in the bottom of the frame, however, banging out three hits (two doubles) and taking advantage of an Albion miscue. Cornerstone pulled within 4-3 in the second as Logan Olson singled and scored on a single by Luettel, but Gretna answered emphatically in the bottom of the inning with six runs to go up 10-3. Gretna had five more hits, including a two-run triple by Cole Samuelson, and also scored on a passed ball and Cornerstone error. From there, Samuelson held Cornerstone at bay, allowing only two fourth-inning runs when Brett Temme doubled in Parker Struebing and scored himself on a passed ball. Albion Cornerstone entered its first game in the playback bracket Sunday with confidence, having defeated York Cornerstone Blue by ten-run rule on the final weekend of the regular season. 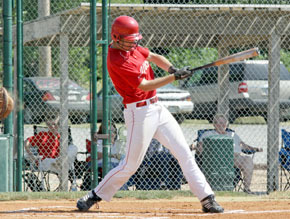 Albion won the battle again in Beatrice, 9-6. 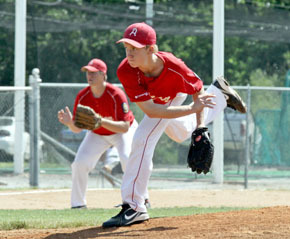 Albion Cornerstone got off to a sizzling start, scoring three in the bottom of the first to take a 3-1 lead. Olson led off with a single and eventually scored on Tyler Hedlund’s sac fly. 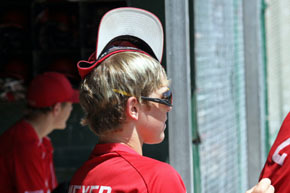 Derek Gentrup reached on a fielder’s choice and came home on a stolen base and passed ball, and Skyler Weber, hit by a pitch, scored on Koch’s subsequent base hit. Cornerstone went up 9-1 with a big second. Temme brought Albion fans to their feet with a leadoff home run that started the fireworks. Olson, Koziol and Gentrup hit consecutive one-out singles and Weber, Koch and Bode followed with three straight two-out base hits before the frame concluded. Albion had one shaky inning, committing three errors in a five-run York third that closed the gap to 9-6, but from there Temme shut the Blues down, allowing just four baserunners over the final four innings. Cornerstone’s seven-game run to the Area 5 championship, quick turnaround to state play and third game in three days at Beatrice may have finally caught up with the Albion Juniors Monday in a 9-0 loss to the host Eagles. Coach Lowell Imus said he sensed a lack of energy in his team as Cornerstone managed just two hits and three baserunners against Beatrice pitcher Travis Ahrens. Beatrice, meanwhile, chipped away at game Albion starter Koziol, scoring two runs in the first and third innings, single runs in the second and fourth, and closing out the win with a three-run fifth.